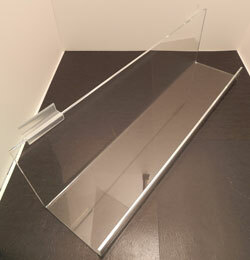 This is an acrylic book shelf for use with slatwall panels. These shelves have a natural tilt to keep your products at a perfect viewing angle. The open ended design allows for multiple shelves to be combined to create a custom display area. The non lipped front edge provides full frontal view of your products and easy access. The acrylic used in the construction of these shelves is of the highest quality to ensure durability.